By John L. Mckenzie S.J. 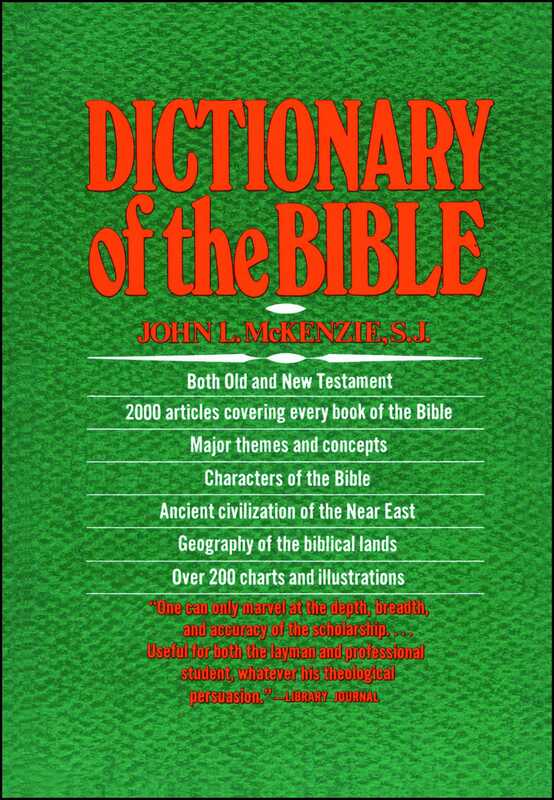 An excellent, single-volume Catholic dictionary of the Bible written by respected Catholic Biblical scholar John L. McKenzie S. J. and originally published in 1965. Fr. John L. McKenzie, S.J., (1910-1991) was an acclaimed Catholic Scripture scholar who wrote numerous books and was the first Catholic scholar on the Divinity School faculty. He was at one time president of the Catholic Biblical Association of America and president of the Society of Biblical Literature. His Dictionary of the Bible is the best one-volume orthodox Catholic Bible dictionary available in the English language—it’s an essential reference tool that should be on the shelf of every good Catholic library. A standard reference work, providing concise descriptions of biblical characters, terms, and places, as well as pertinent illustrations and charts, this is “one of the most up-to-date and reliable dictionaries of the Bible in any language.…Magnificent in scholarship, ample in learning, frank and unhesitating in facing all the difficulties and problems, sympathetic with the varieties and diversities of other views” (Religious Education).